Big Al's Oyster Bar at The Orleans Hotel & Casino is a Las Vegas seafood restaurant that serves freshly shucked oysters and clams. 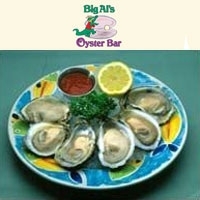 Big Al's Oyster Bar also offers steamed clams, Voodoo mussels, pan roasts, bouillabaisse and pasta dishes all served with an authentic Creole/Cajun flair. OPEN HOURS Sun - Thur: 11 AM to 10 PM. Fri - Sat: 11 AM to 12 AM.